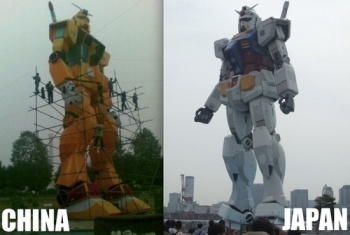 Japan's giant Gundam statue has triumphed in the battle of the giant robots, crushing an oddly-colored knockoff that stood above a Chinese amusement park in Sichuan. Once upon a time, people in Japan built a 60-foot (18-meter) statue of the titular giant robot of beloved sci-fi anime Mobile Suit Gundam. Earlier this month, we learned that an amusement park in China's Sichuan province had built a knockoff version of the statue, albeit one that was smaller and considerably more orange. Infuriated Japanese internet users raged at the theft of one of their national pop culture icons, reports the AFP, with one saying that it should be named "Gansaku" (Japanese for "counterfeit") instead of "Gandamu," and another calling the knockoff out on its frankly horrendous coloring scheme. With Japan's Sotsu Co. - the organization that handles merchandising and trademark issues for the iconic sci-fi franchise - mobilizing its suits, it seems that any potential battle has been forestalled: The Sichuan Gundam has vanished without a trace. Witnesses told the AFP that the statue had been removed from the premises. Officials at Floraland theme park denied the statue's existence on Monday. This goes against earlier claims that the statue was an original design - despite the prominent "EFSF" and "WB" logos on its shoulders (standing for "Earth Federation Space Force" and "White Base," respectively). Of course, it also goes against all photographic evidence, but who's counting? I'm going to choose to believe that the statue hasn't actually gone anywhere; it was merely equipped with a Mirage Colloid system allowing it to turn invisible. Granted, that doesn't make much of a tourist attraction, but it's the principle of the thing. Even without the Gundam statue, Floraland may not be out of hot water yet: Japan's Fuji TV network captured images of statues of characters from the classic action series Ultraman.